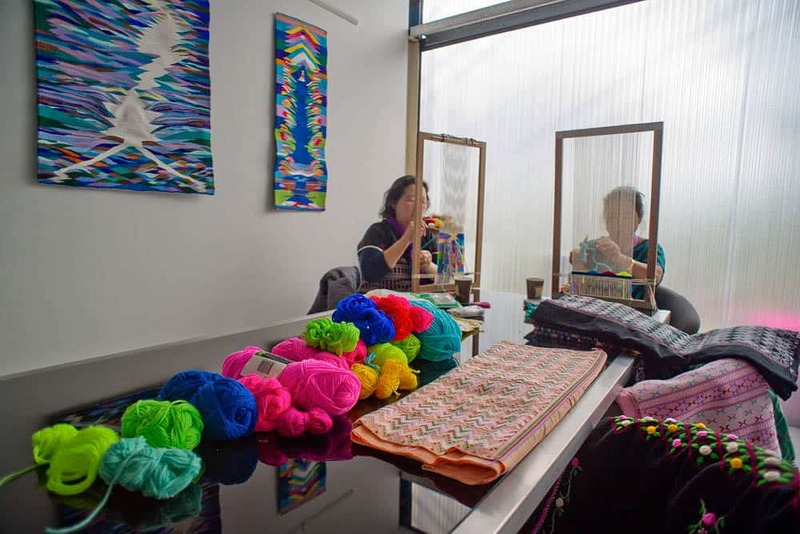 Many refugees who arrive in a Western country like Australia from Southeast Asia bring traditional craft skills are largely absent from their new home. For those who value retaining some of the culture, the challenge is to find ways of maintaining their craft far from the village or camp, with all the new distractions of an urban consumerist lifestyle. Pauline Tran reflects on the way artists and institutions can help develop their skills into a new art form. Shuklay Tahpo, Mu Naw Poe and Cha May Oo arrived in Australia in 2008. They are Karen women, a displaced minority from Burma with a strong tradition in weaving. Seven million of them still reside in Bruma, but there are about 140,000 Karen refugees living in camps in Thailand and approximately 50,000 who have been granted asylum in the US, Canada, Australia and some European countries. 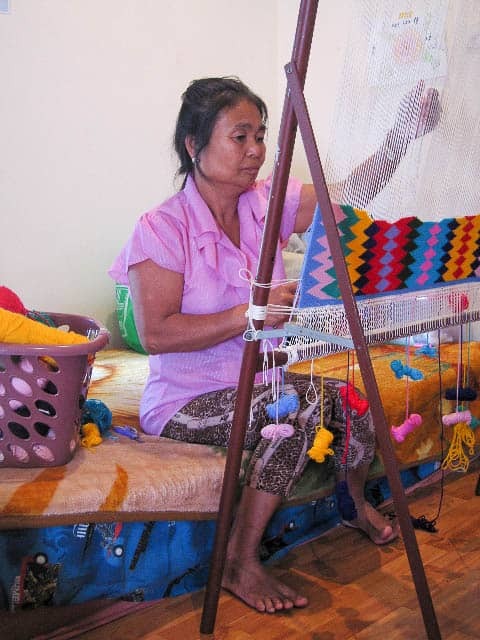 Mu Naw learnt cloth weaving from her mother in her birth country and continued her weaving practice in the refugee camp on the Thai/Burma border where she lived in for 20 years. 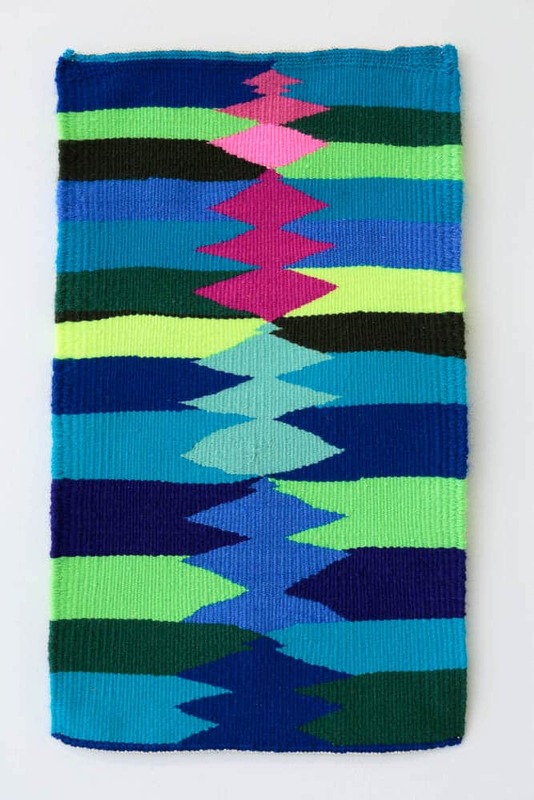 Shuklay on the other hand, had no experience in weaving prior to her arrival in Australia. 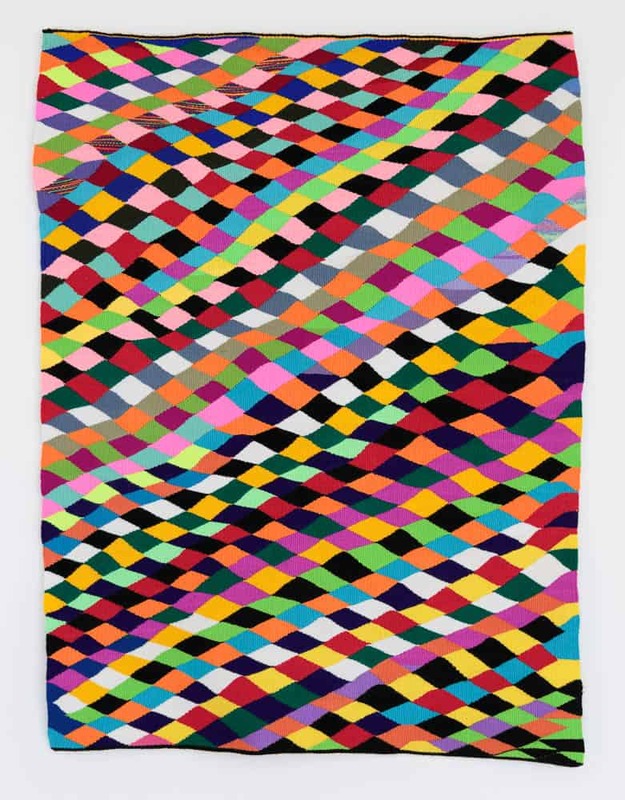 Thanks to her innate understanding of colour and deep passion for the medium, she found her voice in weaving with great ease and grace. 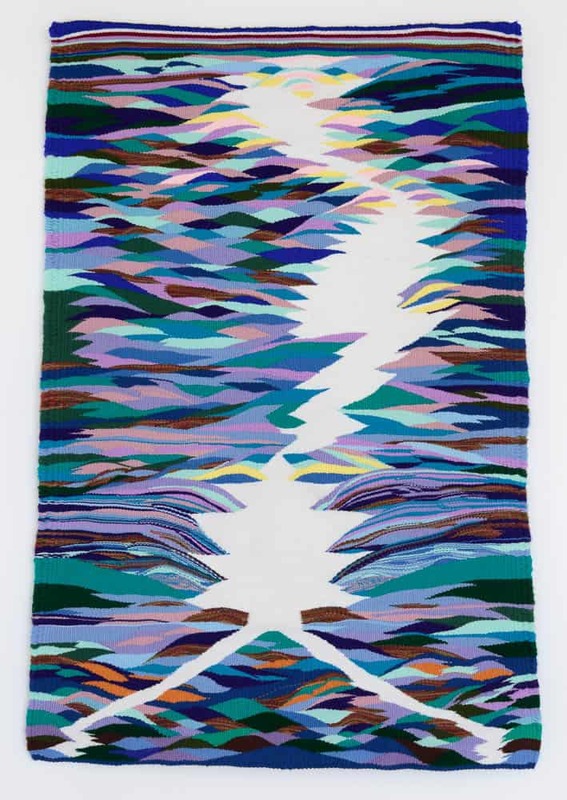 The weavers use their practices to depict their life’s journey from their homeland to Australia. Despite inconceivable hardships along the way, these inspiring women have never ceased the practice of their art. What skills did they bring to Australia? Shuklay and Mu Naw, started out with patterned collages portraying the natural world. Both artists have received awards for their collages in the Heartlands Refugee Art Prize. In 2010, Mu Naw was awarded 2nd prize and in 2012 Shuklay received a Special Mention prize. 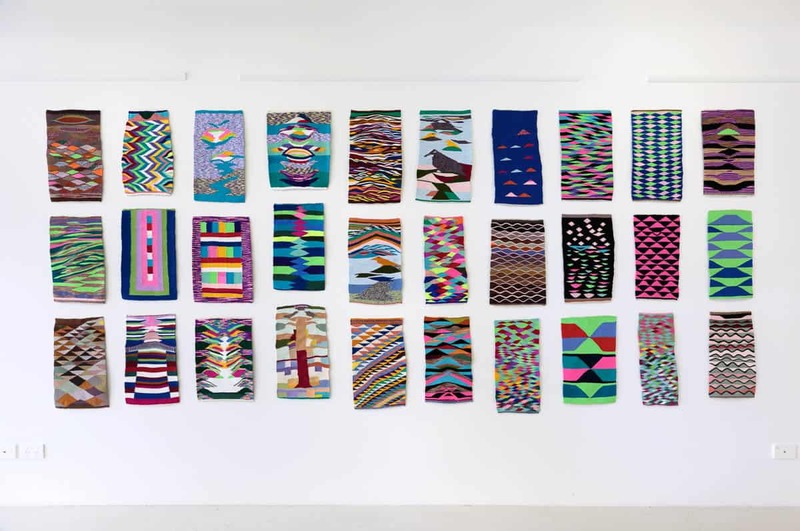 They transitioned very organically to the medium of weaving, juxtaposing their vibrant colour selections and their lyrical styles onto the loom. 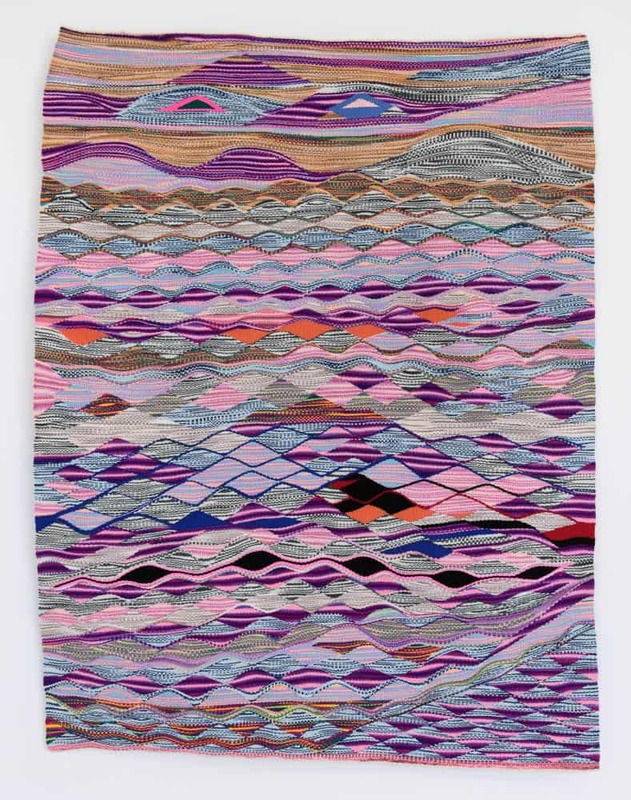 The graphic quality of their work is timeless and adds another dimension to world of tapestry. When I first saw them they took my breath away. The more I learnt about them, the more I was in absolute awe. How did you make contact with them? I actually approached Sara Lindsay to invite her to exhibit her highly distinctive woven pieces at Pop Craft Studio. This cordial “business” relationship flourished into friendship and Sara introduced me to a world I never knew existed—Karen tapestries. 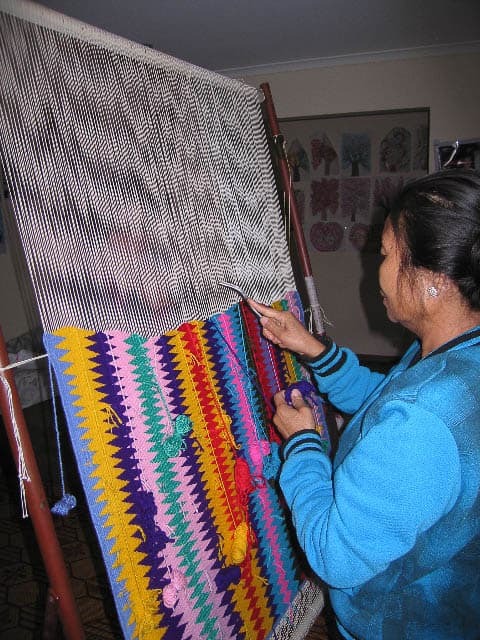 In early 2013, a group of Karen refugee women undertook a tapestry training program at the Australian Tapestry Workshop in Melbourne. Sara was their tutor. She has continued since to work with two members of the group, Mu Naw Poe and Shuklay Tahpo, visiting their homes on a fortnightly basis nurturing their creative souls and supplying them with materials. She holds the key role of being their mentor and mediator. What do you think the Karen women are most keen to get out of this project? Is it money through sales to survive, pride in showing their Karen culture or simply keeping their traditional skills alive? The weavers create these pieces mainly for therapeutic reasons. They live in close quarters with their other family members and practice weaving as a form of meditation and escapism from the daily grind of their domestic realm. They sit in front of their looms (which are often set up in the kitchen) and take their time to enjoy this creative solace and ‘whatever income they raise from exhibitions is a welcome bonus. Last year was a particularly successful year for Shuklay and Mu Nau, the sales from both their shows at Pop Craft Studio and Neon Parlour has allowed one of them to return to their homeland to visit their loved ones for the first time in nine years. This has certainly blown some wind into their sails and the future is looking positive. Do you think there’s a way for these weavers to continue their work? Would this be as artists, who might take up an art degree and produce original works of art? 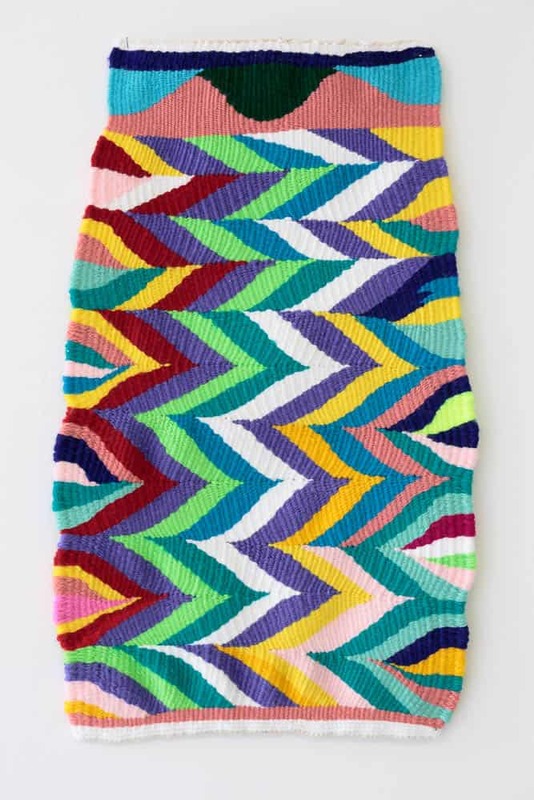 Or might it be better to explore product development, transforming their works into useful items such as clothing or bags that respond to an ongoing demand? Or is their capacity to take an educational role, teaching Karen techniques and culture in schools? 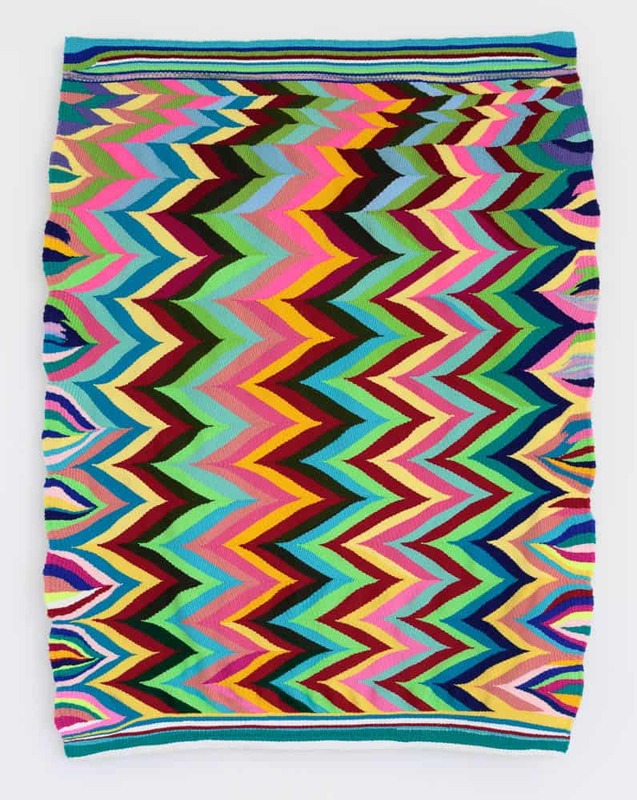 Pauline Tran, a graduate of the RMIT Studio Textile Design, works mainly with fibres. 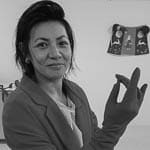 She explores the properties of raw materials and experiments with old and new techniques. An adept of atemporality, Pauline Tran likes to indulge in laborious, repetitious and hypnotising practices. She runs Pop Craft Studio. Wonderful women wow the world! Congratulations to Mu Naw, Shuklay and Cha May Oo for their success, and a million thanks to Sara Lindsay for her kind and astute nurturing of their talent for tapestry. 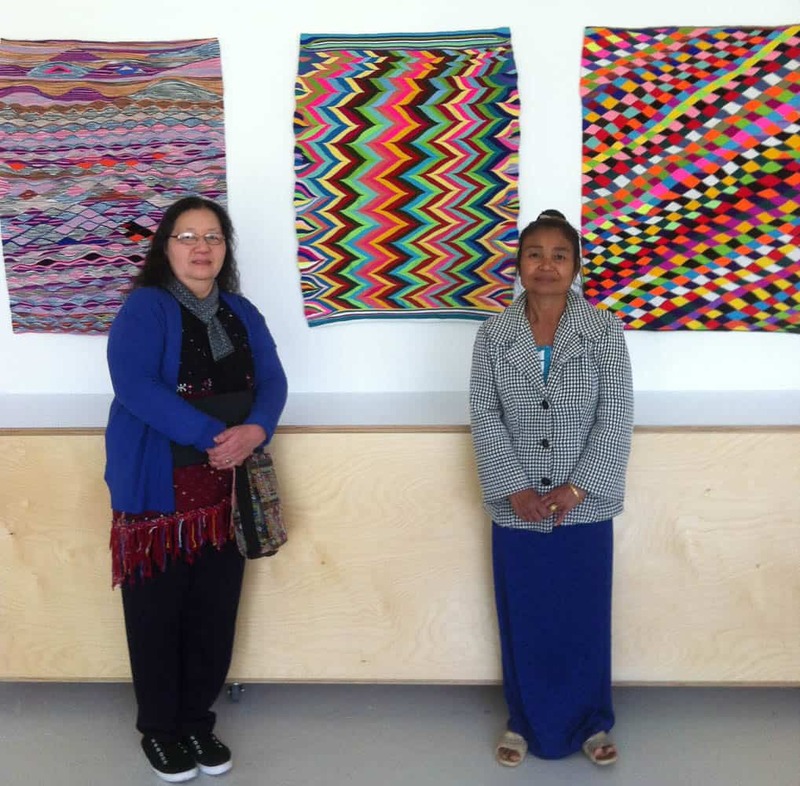 A million to you too Pauline and Pop Craft for your support and appreciation and provision of a space where Mu Naw’s and Cha May Oo’s and Shuklay’s stunning work can be seen. May you all continue to thrive in your good, slow, therapeutic crafts.